Paganism is no longer cloaked in mystery. They were once caricatured as be-robed bearded druids with an odd Victorian belief in the spirits of nature, but paganism – especially in the West – is fast-growing and almost mainstream now. Professor Ronald Hutton, from Bristol University, reckons there could be as many as a quarter of a million pagans in Britain – probably the highest number since Roman times – and now boosted by the results emerging from the recent census, they are getting firmer in asserting their beliefs in a largely secular or Christian country. Pagan leaders have highlighted the numbers of people who declared themselves to be pagans in the 2011 census, which reveal that 79,473 people said they were in England and Wales, compared with 42,262 in the whole of Britain back in 2001. Chris Crowley, the president of the Pagan Federation, said that figure was important because pagans were not awarded their own tick box on the census forms, and to declare their religion as ‘pagan’, people had to tick the box marked ‘other’ and specifically write ‘pagan’ next to it. Emboldened by the rise in numbers to make paganism the seventh biggest religion in this country, Mr Crowley said he was pleased people were more accepting than previously. “We take issue with people using our beliefs in tawdry and cavalier fashion,” he said. “When we first approached the Charity Commission for Wales and England in 1997 seeking charity status, one of its officials asked us if we sacrifice humans. I think we’ve come an awful long way in public understanding since then,” he added. Pagans have long been drawn to the West with sites like ancient Pre-Christian sites like Glastonbury, Avebury and Stonehenge as important symbols of their beliefs. “We are far from an amusing curiosity. Pagans are a serious and growing religious group and these latest census figures reflect that,” added Mr Crowley. 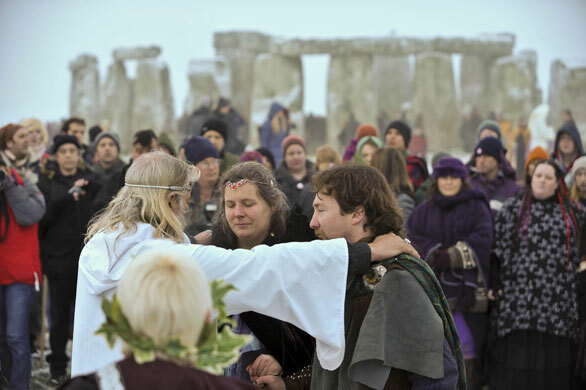 The British Isles perhaps are best known as the home of the Druids, but those are only a small number of modern pagans, explained Prof Hutton, a leading expert in pre-Christian Britain. Pagans celebrate events such as the summer and winter solstice by gathering before sunrise in gardens, forests, hilltops or beaches for organised rituals or their own personal reflection.